Doctor’s Orders: 101 Medically-Proven Tips for Losing Weight is written by Dr. Kent Sasse, a medical doctor who is the director and founder of the International Metabolic Institute. This book is based on his experiences with the treatment of overweight patients and includes 101 of his tips for losing weight and keeping it off. All of his recommendations are based on scientific research and address weight loss from a holistic perspective that includes diet, exercise, goal setting and stress-management. While this book does not prescribe a specific diet, a large number of the weight loss tips will assist dieters to eat in a way that facilitates weight loss. For example, Sasse advises dieter to eat from a smaller plate, which will result in a reduced intake of calories. Although it seems like simple advice, scientific studies show that we actually consume 40% less food when it is served on a smaller plate. Some of the other dietary advice in Doctor’s Orders includes the recommendations to eat breakfast every day, consume protein at each meal and focus on low glycemic index carbohydrates. If you wish to lose weight rapidly and effectively Sasse recommends that you aim for between 800-1000 calories a day. In these situations he also advocates the use of protein bars, shakes and prepackaged meals that are produced by the International Metabolic Institute. In addition Doctor’s Orders provides advice and information on the importance of mindfulness, goal setting and prevention of rebound weight gain. Dieters are given tips on how to eat a healthy diet in the workplace as well as how to fit simple weight loss techniques into a busy lifestyle. The book also includes a variety of recipes for healthy breakfasts, lunches and dinners. Fruit, vegetables, whole wheat bread, pasta, grape nuts, chicken, turkey, pork, beef, fish, eggs, low fat cheese, peanut butter, avocado, red wine. Many of the weight loss tips in Doctor’s Orders are related to exercise. Dieters are encouraged to become involved in a structured fitness program including both cardio and strength-training exercises. The book includes an example of a strength-training workout with illustrations. Additionally there is advice on how to increase your daily physical activity through actions such as taking the stairs instead of the elevator and keeping active while you watch TV. 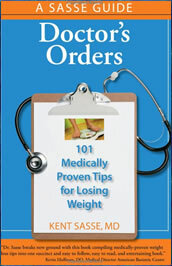 Doctor’s Orders: 101 Medically Proven Tips for Losing Weight retails at $14.95. Simple and easy to read and understand. Encourages a healthy lifestyle approach to weight loss. Author is a medical doctor who specializes in weight loss. Encourages walking and other forms of exercise. Doctor’s Orders does not provide detailed nutritional information or advice. Calorie recommendations for the rapid weight loss plans are too low for physically active dieters. The meal plan provided is based on processed meal replacement foods. Doctor’s Orders provides dieters with a range of practical weight loss tips that are easy to follow, as well as advice that is based on scientific research. With the exception of Sasse’s recommendation to follow a very low calorie diet for rapid weight loss, the information in Doctor’s Orders is aimed at helping dieters to create long-term healthy lifestyle habits that will assist dieters to lose weight and keep it off.